The Moroccan Secretary of State for Water, Charafat Afailal, has announced that Morocco would intensify the use of non-conventional water resources, such as wastewater reuse and desalination. This was at the 8th World Water Forum, which took place from March 19 to 23 2018 in Brasilia. The latest example of such a project is the ambitious project in Agadir. Morocco has been investing since the 1960s in the desalination of seawater intended for drinking and consumption by households. But there is now a considerable change in its policy in this area, with greater use of non-conventional water resources. Charafat Afailal, the Moroccan Secretary of State in charge of water detailed Morocco’s new ambitions. He said: “Morocco is a country affected by climate change and it cannot be limited solely to rainfall. We must open up to other resources that are not affected by these changes, such as seawater desalination or the reuse of treated wastewater. Fresh water being a scarce commodity in Morocco, these changes come at the right time with the rainfall which is taking much time to arrive and the quantity of rainwater which drops very regularly. In this context, the use of sea water is a solution that will make it possible to relieve the Moroccan populations, in particular those of the centre of the country which, until now, depend enormously on rainwater. The country is also revealing its ambition through the resourceful desalination plant project in Agadir, which has recently tripled in size, costing 309 million euros. The project now includes the construction of a plant with an initial capacity of 275,000 m³ of water per day, which can be extended to 450,000 m³ per day. It is now nothing less than the largest desalination plant in the world that the Spanish industrial group Abengoa is preparing to build. A plant that will use reverse osmosis to filter seawater, using huge high-pressure pumps, through semi-permeable membranes that only let water molecules through. 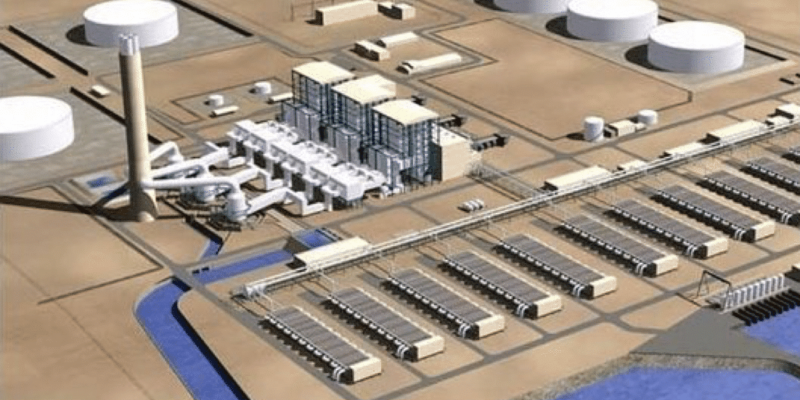 A relatively energy-intensive process and the power supply for the Agadir plant will also come directly from the Noor Ouazarate solar power plant. Once completed, this plant should start producing nearly 150,000 cubic metres of water per day for food consumption and 125,000 to irrigate the 13,600 hectares of plantations located near the famous Moroccan seaside resort. Under the contract, Abengoa will construct, operate and maintain the infrastructure for a period of 27 years. The company will also provide financing, in partnership with the Moroccan fund InfraMaroc, a subsidiary of the country’s Deposit and Management Fund. The former European flagship of the green economy, the Spanish group, which has been based in Morocco since 1977, came very close to bankruptcy in 2016. But its debt was restructured and the sale in 2017 of a French bioethanol plant in Lacq for 1.1 billion euros made it possible to bail out the company. Almost at the same time, Morocco expressed its readiness to provide “technical assistance” to Gaza in the framework of the seawater desalination project. This was indicated by the Kingdom’s Ambassador in Brussels, Ahmed Réda Chami, on the sidelines of the meeting of donor countries for the implementation of this project. Another illustration of the central role Morocco intends to play as a provider of green solutions.